The summary description of “Black Chalk” enticed me with the novel’s premise, yet it also made me wary with its comparisons to Donna Tartt’s brilliant “The Secret History”. Both of these initial impressions proved well-founded. 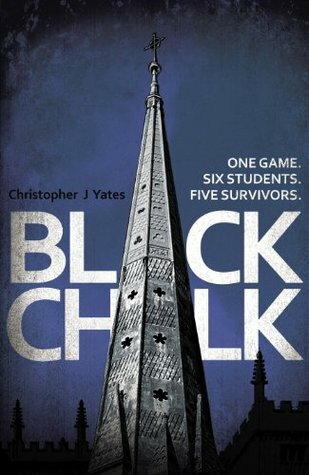 Yates’ debut novel is built around a terrific idea, the development and consequences of a cruel, high-stakes game developed by a group of college students. This period and setting of life, simultaneously a step forward into ‘adulthood’ and also a regression to child-like social mentalities, is prime both for literary exploration and construction of a wonderful thriller as Donna Tartt proved. Whether Yates’ work here is directly influenced by Tartt’s novel or just bears chance similarities in plot, it is notable that the similarities between works are superficial, at the level of setting and general themes. In addition to a secretive group of intelligent, though naive, students, “Black Chalk” has the additional element of an enigmatic outside force shaping the start of events. “Game Club” as they are called, make one of the most intriguing aspects of the novel, yet its purpose and secret wind up being rather mundane, leaving this element sadly under-utilized. Instead, “Black Chalk” focuses on the students, particularly the founding pair of the group, using a narrative structure of first person recounting prior events through third person. As the history is told, it becomes clear both who the narrator is and that he suffers from mental problems and drug side effects, suggesting his related information may be unreliable. Indeed it begins to appear that some of the recorded text may not even be the narrator’s own words, but something another has come in and added to his writings. Unfortunately, very little is done with the potential created by this unreliability. Past events are described still from solely this unreliable point of view, leaving things confusing just how much is ‘true’ and what is imagined or altered. Initial suspense created by the narrative structure and the general premise of the plot become bogged down in much of the inaction of the novel’s progression. The social disintegration of the student’s friendship is hardly surprising, and the cruel games end up feeling not terribly bad considering the build up for horrors that the mind of the reader may begin to imagine. The suspense of the novel builds the reader up for an eventual showdown and ending to the ‘game’, and while the ultimate solution for achieving victory is well constructed, this showdown also ends up feeling like a let-down, far less disastrous or horrible as expectations may be. The writing of “Black Chalk” is good, but it doesn’t give the novel the same literary weight as Tartt’s work, covering similar issues, but without the degree of symbolism, allusions, etc. In the end it could still have been a decent thriller, but never managed to be as ‘disturbing’ as I initially expected from the premise. I think Yates has the talent to produce some great works, this debut just had too many issues in terms of characterization, depth, missed opportunities, and the unfortunate invitation for comparison to “The Secret History”.